Expert Basketball Academy | South County Sports Club, Inc. The Expert Basketball Training Academy is a comprehensive skill development program to help individuals meet their goals in basketball. We have experience developing youth, high school, college and professional players with skill-focused workouts for over thirty years. Our attention to detail with each and every player ensures that developmental needs are addressed, and results follow. We believe in the part whole method of teaching the fundamental and team skills of basketball. Our goal is to help your child get better with the ultimate goal of becoming a valuable member of their team. 1 on 1 Private Lessons: detailed instruction, tailored to the players’ needs. Skill work, balance & work ethic is emphasized. Small Group Lessons: High-intensity drills and instruction in both individual skill and team dynamics. Sign up as an individual, with teammates or friends, or as an entire team. “Little Jammers”, 4-6 Year Olds: Teaching youngsters the most basic ball skills and motor skills. A fun approach which addresses balance, eye-hand coordination, running and motor skills, teamwork, and basic basketball skills. A must for the little ones! "Basketball 101", 4-6th Grade: This program is for players who are still relatively new to the game. Fundamental skills, basic basketball terminology and basic tactical elements of the game will be taught. This introduction to the game will be both fun and develop a better sense of structure for the player. Tuition (minimum of 5 sessions): $50/session. Register online NOW! NEW! 5th/6th & 7th/8th Grade Girls Skills Drills & Scrimmages: This grassroots program addresses developmentally appropriate skills via advanced and experienced teaching techniques, and the girls have the opportunity to play live on the day with the scrimmages each week. Focused 50-minute workouts featuring: Comprehensive Skill Work – Speed, Agility & Quickness Training – Fitness –Simulated Practices- Special Situations. Register online NOW! The Expert Academy will bring advanced performance training to your team. Through intense drills, conditioning, and skill work we can maximize the skill development, skill consistency, knowledge and understanding of each athlete. Training Sessions will cover endurance, agility, individual skill development as well as drills that will enhance each athlete as a team player. The goal is to give each player a variety of skills throughout the session that they need to take their game to the next level and your team to the next level. The One Day Basketball Camp is offered on select weekdays in which school is not in session throughout the traditional school calendar. The one day camp will emphasize the fundamentals and advanced techniques for Shooting, Ball Control, Defense, Rebounding, Passing and Conditioning. Additionally, campers will participate in contests, games and other fun events. Each One Day Camp will operate from 9:00 AM – 3:00 PM and be structured according to the age and ability of the participants. Late pick up and early drop off is available for an additional fee. The Spring Break Camp is a great place for any young basketball player who is willing to improve his skills, learn new moves, make new friends and have fun! 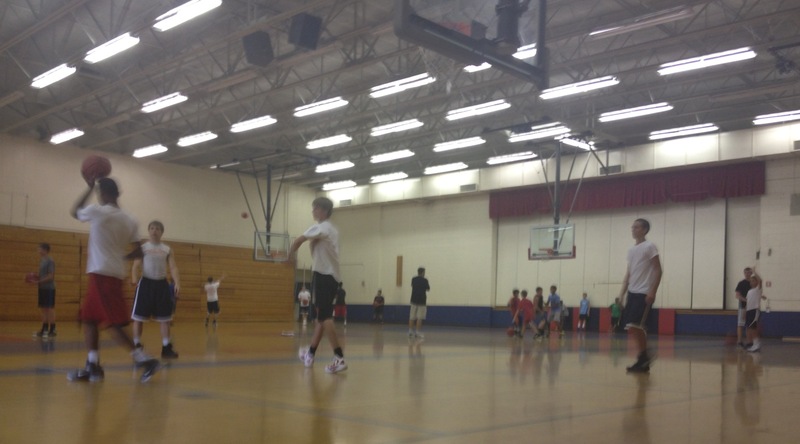 Campers will develop and elevate all of their basketball skill sets. - shooting, passing, dribbling, rebounding and defense. Over the course of the week, campers self-confidence will grow along with overall appreciation of the game. It is our goal to teach new fundamentally sound basketball skills and improve young student athletes abilities in the finer points of the game. It is our goal dueing camp not only to develop the high school and college players of tomorrow, but to help all our campers acquire the important ideals of good sportsmanship and leadership. The Winter Break Camp is a great place for any young basketball player who is willing to improve his skills, learn new moves, make new friends and have fun! Campers will develop and elevate all of their basketball skill sets. - shooting, passing, dribbling, rebounding and defense. Over the course of the week, campers self-confidence will grow along with overall appreciation of the game. It is our goal to teach new fundamentally sound basketball skills and improve young student athletes abilities in the finer points of the game. It is our goal dueing camp not only to develop the high school and college players of tomorrow, but to help all our campers acquire the important ideals of good sportsmanship and leadership. The Expert Academy Summer Camp is a great place for any young athlete who is willing to improve and experience muliple sports, work hard, make new friends and have fun! Campers will develop skills in basketball, dodgeball, baseball, soccer, and many more. Over the course of the week, their self-confidence will grow along with their skills and overall appreciation of each sport and activity. It is our primary aim to teach the fundamentals within each sport and improve student athletes abilities in the finer points of each game. It is our desire not only to develop the high school and college players of tomorrow, but to help all our campers acquire the important ideals of good sportsmanship and leadership.